Enjoy freshly shucked oysters and boston lobsters at the Seafood Bar. 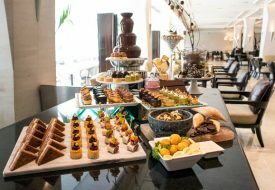 Here’s a good reason to drag yourself out of bed on a cosy Sunday — Oscar’s has unveiled a spanking new Sunday Brunch menu. The common consensus is that buffets tend to leave you feeling stuffed and sluggish. At Oscars, you’ll find a nice balance of nourishment and decadence. Their new 4 metre-long salad bar features over 30 toppings including organic chia seeds, Montmorency cherries and red raisins. You’ll also find a selection of 10 small plates including Chefs’ creations such as quinoa with fava beans as well as eight dressings including unique homemade dressings such as blueberry, vanilla bean, champagne vinegar and yoghurt. We suggest taking salad breaks in between the other dishes to counterbalance the indulgence. Counterbalance your indulgence with some super yummy salads and smoothies. 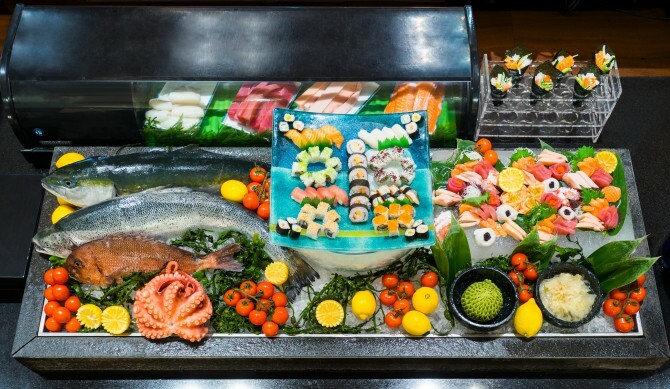 Apart from the seafood counter, live stations are always the highlight of any buffet. At Oscars, there are four to whet your appetite. The Organic Eggs station gives you the option of soft poached eggs with cauliflower purée, sautéed spinach, foie gras and truffle oil, or eggs benedict. Ready your cameras because there will be #eggporn with these runny, glorious eggs. 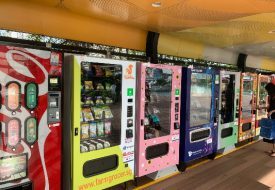 Those who fancy local favourites shouldn’t miss out on the Noodle Bar where items like Oscar’s Laksa, Slipper Lobster Noodle with Pork Ribs and Bak Chor Mee (minced pork and fishball dry noodles with vinegar and homemade chilli paste), are made fresh upon order. The broth of the lobster noodles was especially fragrant and moreish! Finally, make space for some organic pasta and foie gras — these were pretty well-executed too. We love having options and Oscar’s offers plenty. 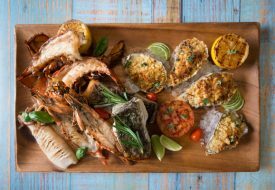 Diners can opt to top up S$20++ to finish their buffet with bottomless rounds of sparkling wine, house wines and selected cocktails; or S$60++ to supercharge their Sundays with free-flowing Laurent-Perrier Brut, NV Champagne, house wines and selected cocktails. Alternatively, there’re freshly made shakes featuring a variety of superfoods including chia seeds, fresh berries, mangoes, strawberries, Greek yoghurt and Jarrah honey; as well as health supplements such as whey protein, lucama, maca and camu powder. Don’t miss out on the live stations! You must’ve heard of the famous roasted “London Duck”, which is specially imported from the farms in Ireland. The ducks are reared with extremely high farming standards, resulting in crispy skin with succulent meat when roasted. Oscars’ version is as decadent as it can get — crisp skin hides a soft layer of unctuous fat and tender meat. It was so good, we wish we could pack some home. The carving station menu rotates weekly and you’ll find items like slow-roasted Argentinian, Mauritian or Chinese-style whole suckling pig as well as oven roasted US prime rib. Fresh sashimi and sushi galore. If you’ve got a sweet tooth, you might as well make a beeline to the desserts right from the start. Watch as the chefs make liquid nitrogen ice cream, in flavours like sweet potato and pineapple. The latter had to be my favourite — it was smooth, creamy, with the intense sweet-tangy taste of the fruit. You could also indulge in flambéed crepes suzette with Grand Marnier or Cointreau, maqui powder pancakes; or Oscar’s Waffles with organic maple syrup. Finally, go for some of Oscar’s black forest cake and you’re all set. The Conrad Centennial Singapore Supercharged Sunday Brunch is available every Sunday, from 12.30pm to 3.30pm, at Oscar’s Restaurant, located on the lobby level. Prices start from $98 per adult.